YOUR URGENT SUPPORT FOR WEST PAPUA MEDIA’S ONGOING COMMUNICATIONS AND MEDIA ADVOCACY COSTS HAS AND WILL CONTINUE TO MAKE A SIGNIFICANT DIFFERENCE TO THE ABILITY FOR FRONTLINE CITIZEN AND PROFESSIONAL JOURNALISTS TO DELIVER FEARLESS, CREDIBLE AND ROBUST JOURNALISM FROM WEST PAPUA TO THE WORLD. West Papua Media is now entering its ninth year delivering credible independent and indigenous journalism from West Papuan journalists, and human rights, legal, social justice and environmental defenders, to the world. We have been a fully-fledged outlet since June 2010, and we hope to continue well into the future. Of course we have always been volunteers, and often fund this work out of our own well worn pockets. But we need your help to help us to continue to support and build a credible free independent media in West Papua, that can operate with safety..
Our impact has been huge and positive. Our initial model – which we stick to today – has a network of clandestine, trained stringers and undercover journalists in the field around Papua who could securely verify source reports independently, safely, and quickly. With the advent of instant social media capacity many activists have moved to sending UNVERIFIED reports to certain exile activist groups, who have little capacity or desire to spend the hard slog involved in ensuring that reports that they publish are accurate, verifiable or even true. In the race to get the most clicks, credibility of the West Papua story has suffered, as photos of old events, or events in other parts of the world, are relabelled as “evidence” of Indonesian brutality and distributed virally on social media by many who will not do even basic fact checking. This is very harmful in the long run, and it is something the WPM’s constituency in Papua literally cry about. West Papua Media IS different. We believe in credibility. We believe in verifying and proving beyond all doubt that an abuses have occurred, by using a scientific process of verifying independently Who did what to whom, when where, how and why. We ask for proof, or we label assertions as quotes. We do metadata analysis of photographs (and of course reverse image searches to make sure the image isn’t recycled and relabelled). We believe there are enough powerful stories of survival and resistance of Indonesia’s colonial brutality in West Papua, and its peoples’ desire for basic rights like the universal right to Self-determination to not need to make it up. But it is hard, it costs a lot of money to make it happen, and that money is hard to come by – which is why we urgently need your help. The very act of producing credible media is a powerful act of Self-determination, as is so powerfully demonstrated by our indigenous media partners, Tabloid Jubi, Suara Papua, and Majalah Selangkah, to name but a few. We have worked with literally hundreds of international media outlets to deliver groundbreaking independent coverage of West Papua to the world. We have worked with generations of frontline activists and journalists to bring to real and honest aspirations of West Papua to the world. Together with our partners and pioneering West Papuan journalists, West Papua Media has re-established links between international media safety organisations to really draw attention to the lack of media safety and freedom in Papua. Make no mistake, the media ban remains firmly in place for those who wish to cover the aspirations of the people, the military and police repression, and issues related to colonial exploitation, like mining, agribusiness, Oil Palm and of course illegal logging – all of which are conducted by senior members of Indonesia’s security forces. Our clandestine network has smuggled in scores of journalists to West Papua since 2007, and provided unmatched security and fixing services for well over 300 individual journalists, many of whom are regular writers on the issue now. We have helped many journalists make their careers with major scoops, although the few of those journalists who give back are in the minority, we maintain a close working relationship with these journalists. We have published over 1,200 articles on our site, and generated content for over thirty-thousand article since 2007. 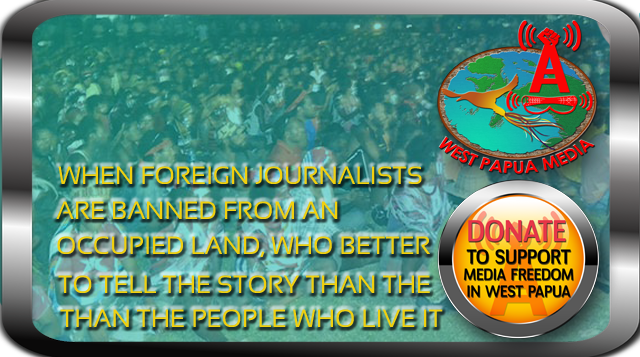 Just google “West Papua Media” to see the impact we have had, and to read papers about our work. Just as West Papua Media (WPM)is moving forward with a host of exciting new projects and technologies to support media freedom in Papua, our crew are again staring down the barrel of a day-to-day funding gun. Yes, the main website of Westpapuamedia.info has been a little quiet. However, published investigations and news articles are just the tip of the iceberg for what we do. a new Field Guide to Safe Witness Journalism (eyeSafeMOJO) which will be distributed for testing by the end of the year. developing a new and improved vertical assessment methodology for human security Incident Reporting, which we are incorporating and coding into the secure Martus Human Rights Bulletin System, now usable safely on Mobile phones and tablets. What else we been doing whilst not publishing? During 2015, WPM has also been directly assisting over 40 international and regional journalists intensively in getting stories out into the media, getting and also working to secure international journalists to continue and increase coverage across many story sectors for 2016 and beyond. We have also been assisting journalists to travel into West Papua undercover. Whilst the Indonesian President Jokowi loudly claimed that the Foreign Media ban is officially ended, the reality is foreign media still are subject to massive surveillance and restrictions, especially in coverage of genuine Papuan aspirations. WPM is also engaged in a major digital archiving project for journalism content, and a new website with more social integration and will be launched in 2016. However, because we have not been publishing so much original content, most of this work has gone unnoticed and unfunded, and donations have been slow (but well appreciated). West Papua Media urgently needs your generous assistance to pay for significant communications costs imposed on us over the last few months and to guarantee our uptime. a full investigation on who the real culprits are behind the ongoing forest burning crisis, and how to stop them. Ongoing and intensifying conflict issues caused by transmigration labour for Papua wide Military road building projects. Shifting and escalating Australian corporate, banking, military and government underwriting of major environmental, social and human security abuses in West Papua. A significant assessment on the plans, opportunities and challenges for West Papua’s resistance movement, inside West Papua, regionally, and internationally. Opinion and analysis by leading West Papuan thinkers. And of course, ongoing translation and syndication from our indigenous media partners daily news from West Papua. Please help us bring this to publication and reality. We urgently need to raise around $A8000 to pay for Website costs, anti-ddos mirroring and cybersecurity, phone bills (over $1500 is owing on that alone), and the obvious costs of phone internet access for all of our team. Our phone and internet access is critical, with red letters turning into restrictions on our ability to report. We are also attempting to provide secure Blackphones to frontline journalists, so sponsorship is being sought for the (heavily discounted) purchase of these units. We can also provide them, with training, for sale to those concerned about Indonesian and Australian government surveillance on your communications. Your support will go a long way to helping get truthful, credible investigative journalism from West Papua to the world. Please remember we are all entirely volunteer and do not get paid for our work, despite it being a full time job. Please donate directly to us below via Paypal, Bitcoin or via our bank below. Please help if you can by donate generously as soon as you can, as our server subscription is literally about to expire tomorrow (November 8), and we are still hundreds of dollars shy of keeping it online.